Feeling stuck in an apartment that you no longer love? It might be time to leave that old place and move to your dream apartment or a new house. But how do you even go about making that move? The first step is to identify the reasons why you are stuck in that apartment in the first place. Once you’ve done that, it’s time to formulate a plan to get you out of your old place and into your new one. Here are the 5 steps you need to take to leave your apartment in style and find your dream home. All good things start with proper planning – and that includes throwing a moving party. But if you really want to light a fire to get you going, set a date for that party before you even find your new home. With a fixed deadline set in stone, you’ll have to get on track and do what’s necessary to make the move happen. Having a deadline in mind also helps to keep you accountable. Plus, by putting a moving party on your calendar in advance, you can get more friends to join in and lend a helping hand. The concept of the going away party/moving party is the ideal way to leave your apartment in style. You can make the party as big or as small as you want – just make it memorable. 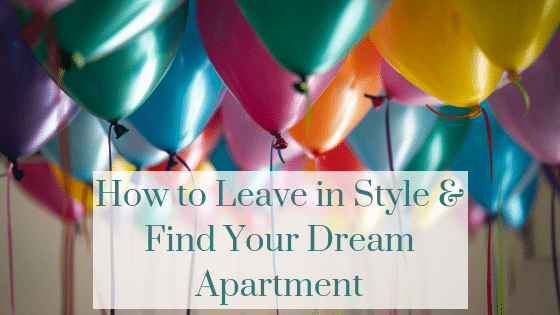 We always love a party with a theme, and if you do it right it will leave you with one great last memory of your apartment. The better the party is, the easier it will be to get friends to help you when it’s time to host your next moving bash. Before you start house hunting or apartment shopping, make a list that details all the requirements you want in your new home. Separate your list into two parts – non-negotiable items and things that you want but can live without. For example, if you have a dog, a pet-friendly apartment complex belongs on your non-negotiable list. If you want a pool, but don’t have your heart set on one, put that into the column of things you can live without. Take everything into consideration when creating your list. Think about the proximity of your place to work or school. Think about the amenities you need. Do you want a two bedroom place so you can have a home office or a guest room for out-of-town friends? Do you want a patio or a private deck or is common outdoor space all that you require? Think about the little details so you can really cover your bases. There’s no point in apartment shopping unless you know what you can spend. It’s reasonable to have fears about your dream apartment costing more than you can afford, but there are some things you can do to manage those fears. Check out this article (link to Part 1) for more details on how to get over your budget-related moving fears. When we talk about a budget we’re not just talking about the cost of rent. We’re talking about all sorts of factors that you might not have even thought of yet. Things like the cost of utilities, the cost of laundry, and the cost of gas if you’ll have a longer commute. Build all of these elements into your budget up front so that you don’t run into any surprises down the road. Finding your dream apartment at an affordable price isn’t always easy. And that’s because you’re probably not the only person who wants a well-priced, amazing place. Think of your apartment hunt like a job search – you know there is going to be competition out there. But you can get a leg up on your competition by doing one simple thing: get your paperwork in order. Before you start viewing apartments, get a few crucial things together and you’ll instantly have an advantage over other tenants. Print out a copy of your rental history complete with the contact information of previous landlords. Have proof of employment, salary statements or pay stubs, and a recent copy of your credit report. Put everything in an envelope and take it with you every time you look at a place. That way, when you find the place you love, you’ll be able to provide all that important info to the landlord right then and there. Another thing to have ready is your down payment. There’s no point in looking for a place if you’re not prepared to make a down payment and a security deposit. If there is an application necessary for the rental, have that completed as well. When you’re apartment hunting, it’s wise to make use of your network of friends and colleagues. Friends, relatives, and coworkers might know of an apartment vacancy before it ever hits the market. They might work with someone who’s living in your dream apartment right now but planning to move out in the next month or two. If you can come upon an apartment by way of a referral, you’ll be ahead of the competition. And that means you’ll be one step closer to living in your dream place. Moving out of your current, comfortable apartment and into your dream place can be scary and exciting at the same time. It can also be stressful and a bit overwhelming, but there are some things you can do to make the process run as smoothly as possible. Set a deadline for yourself and plan a moving party to say a stylish farewell to your old place. Set a budget that includes rent, utilities, and all other likely expenses. Make of list of everything you want your dream home to have. Get your paperwork in order, be ready to make a down payment, and make use of your network – friends and relatives might be able to get you a referral. With your goals in mind and a plan in place, finding and moving into your dream apartment will be much easier than you think.